A halved joint is one in which half the thickness of each member is notched out and the remaining portion of one just fits into the notch in the other, so that the upper and under surfaces of the members are flush. No. 14. 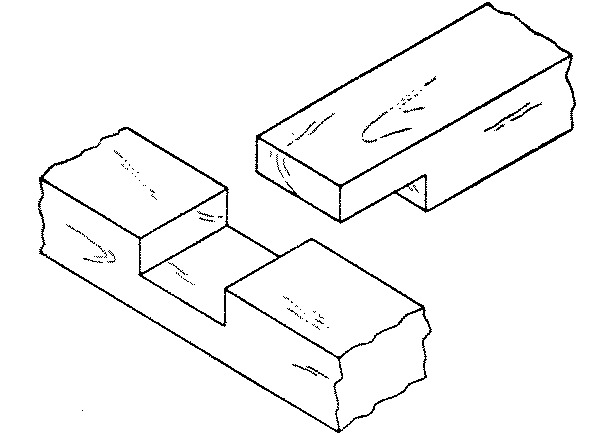 A cross-lap joint is a halved joint in which both members project both ways from the joint. 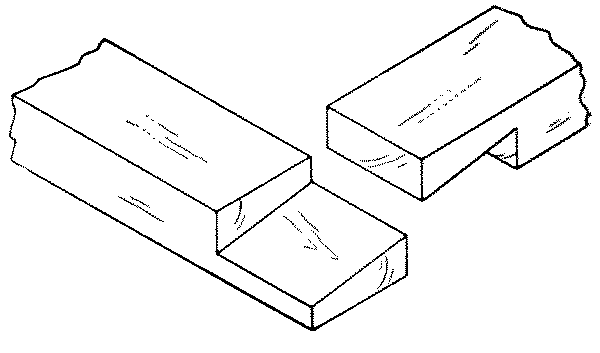 This is a very common joint used in both carpentry and joinery, as where stringers cross each other in the same plane. The two pieces are first dressed exactly to the required size, either separately or by the method of making duplicate parts, see Chap. IX. Lay one member, called X, across the other in the position which they are to occupy when finished and mark plainly their upper faces, which will be flush when the piece is finished. Locate the middle of the length of the lower piece, called Y, on one axis, and from this point lay off on this axis half the width of the upper piece, X. From this point square across Y with the knife and try-square. Lay X again in its place, exactly along the line just scored. Then mark with the knife on Y the width of X, which may then be removed and the second line squared across Y. From these two lines square across both edges of Y to approximately one-half the thickness. Now turn X face down, lay Y on it, and mark it in the same way as Y. Set the gauge at one-half the thickness of the pieces, and gauge between the lines on the edges, taking care to hold the head of the gauge against the marked faces. Then even if one piece is gauged so as to be cut a little too deep, the other will be gauged so as to be cut proportionately less, and the joint will fit. Cut a slight triangular groove on the waste side of the knife-marks, Fig. 91, saw accurately to the gauged lines, and chisel out the waste as in a dado, see Figs. 70 and 71. The bottom of the dado thus cut should be flat so as to afford surface for gluing. When well made, a cross-lap joint does not need to be pounded together but will fit tight under pressure of the hands. No. 15. 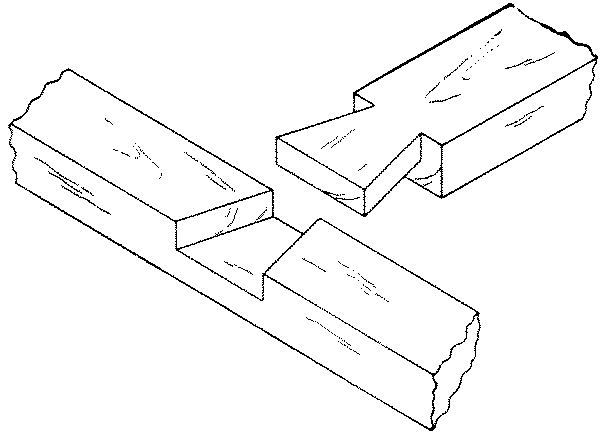 A middle-lap joint or halved tee is made in the same way as a cross-lap joint, but one member projects from the joint in only one direction, it is used to join stretchers to rails as in floor timbers. No. 16. 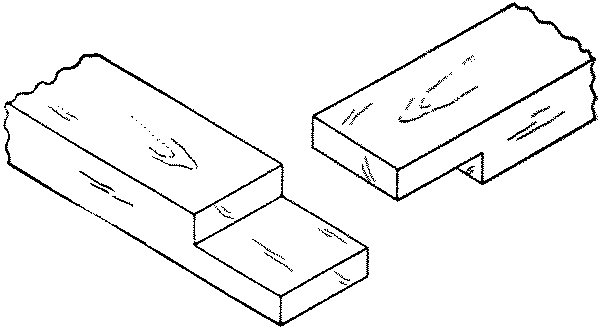 An end-lap joint is made in the same way as a cross-lap joint except that the joint is at the end of both members. It is used at the corners of sills and plates, also sometimes in chair-seats. To make an end-lap joint, place the members in their relative positions, faces up, and mark plainly. Mark carefully on each member the inside corner, allowing the end of each member slightly (1⁄16“) to overlap the other. Square across at these points with a sharp knife point, on the under side of the upper member, and on the upper side of the lower member. Now proceed as in the cross-lap joint, except that the gauged line runs around the end and the cutting must be done exactly to this line. No. 17. 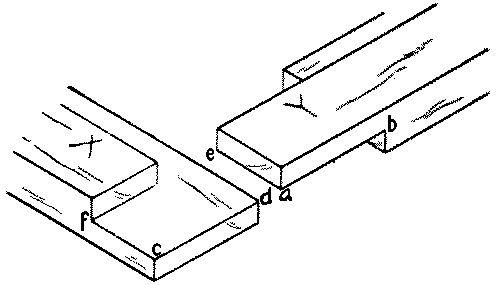 In an end-lap joint on rabbeted pieces the joint must be adapted to the rabbet. The rabbet should therefore be plowed before the joint is made. The rabbet at the end of the piece X is cut not the entire width of the piece Y, but only the width of the lap,—c-f = a-e. This joint is used occasionally in picture-frames. No. 18. A dovetail halving or lap-dovetail is a middle-lap joint with the pin made dovetail in shape, and is thus better able to resist tension. It is used for strong tee joints. No. 19. 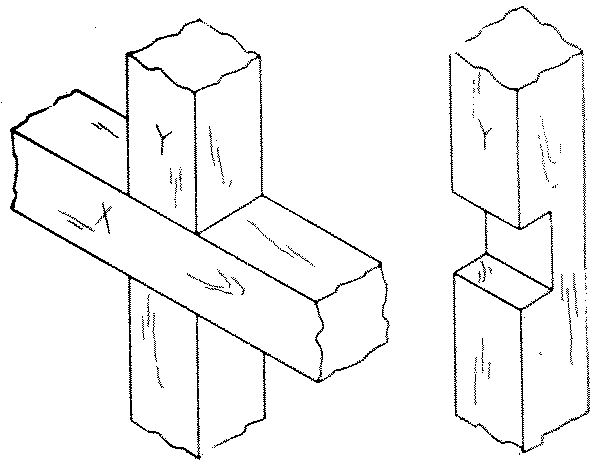 A beveled halving is made like a middle-lap joint except that the inner end of the upper member is thinner so that the adjoining cheeks are beveled. It is very strong when loaded above. It was formerly used in house framing.